This article is reproduced by kind permission of Jeremy Howe and Steve Bowbrick, BBC, and first appeared on the bbc blog. Steve (editor of the Radio 4 blog) asked me if we had any interesting material about the genesis of the Lockerbie on Trial programme that I co-produced with Margaret Renn back in 2001: court transcripts, etc. that he could use on this blog. I thought my offer of sending him the nearly 10,000 pages I have on file was a bit cheeky, but it did prompt me to recall the crazy days we spent in producing the programme. It was an extraordinary trial and it seemed to me that one way of getting to the bottom of the story was to do a dramatised reconstruction of the trial itself, to get the feel of the court and the barristers, the judges and the gallery of witnesses, some of whom appeared to be characters straight out of a spy novel by John le Carré, and all in their own words. We wanted to tell the whole arc of the story. Slightly insanely I also persuaded Radio 4 that we should try and broadcast the programme while it was still in the news. Of course the problem with that was that no one knew when the trial would end: the transmission date, and therefore the production date, was a completely moving target. Margaret, Peter Goodchild (the writer) and I had been tracking the story for months: the court sat for 84 days, commencing proceedings in May 2000 with long breaks for adjournments. Peter digested the daily transcripts, but by Christmas there was no end in sight. Then in January things changed, and events moved pretty rapidly when the defence teams announced that they would be offering no further evidence. Instead of having several months to gear up we had several days. What had been an ambitious programme idea looked alarmingly like it might become very real very fast. Which made me feel physically sick. I remember sitting in a café in Bristol on the Wednesday the verdict was announced. The three of us calmly discussed the release of Fhimah and the conviction of Megrahi, and working out how we would put the programme together. All the time I was thinking how on earth do we write and make a drama which had been given a 90 minute transmission slot in just under three weeks time? Had I gone completely mad? Small matters like Peter needing to make informed decisions on which 9900 pages of transcript to junk and which 90 to keep in, decisions which needed to be made by the weekend. It didn't help Peter that the verdict was not exactly what we had been expecting - in short we tore up all our homework and started almost from scratch. It was a long lunch. Apart from booking a studio for a three day record and a three day edit the week after next, and starting to think about casting a dozen or so actors with a variety of accents ranging from Scottish to American via Maltese, Libyan and Eastern European, there was precious little I could do until I had a draft script. I left early as I had to write the programme billing for the Radio Times to meet their deadline that afternoon: as a drama producer I do find it helps to write these things once the programme has been finished, not before I had started. Now I had long preached how drama on radio could be reactive to news stories in a way that television could not, because of the very short production process radio drama has, but I had never actually made anything this fast. It felt like I had put my head on a block and had invited someone to chop it off. In public. I kind of think you need a fear factor to make an outstanding programme. But this was fear factor 10. If I am honest, making the programme was like making any other: the budgetting, the casting, the scripting, the scheduling, getting the logistics right - except none of us got any sleep, we all traveled at the speed of light and there was never an opportunity to deliberate over decisions. All this was tempered by the fact that the three of us felt an enormous duty of care to the victims of Pan Am 103, to their relatives and to the huge number of people who had given up their lives to bring this case to justice. We had to get it right. Peter delivered several drafts of the script, with Margaret (a journalist) giving him notes on accuracy and nuance and me (a drama producer) giving him entirely contrary notes about the dramatic thrust of the storyline. Amazingly he never shouted at us. Miraculously we kind of had a cast by the time we started recording less than a fortnight after our Bristol lunch date, and the completed programme was biked over to Radio 4 with two days to spare before broadcast. And listening to it again I am still very proud of it - not because I think it is a good programme or that we did it so fast - but because I believe we had done the story justice. 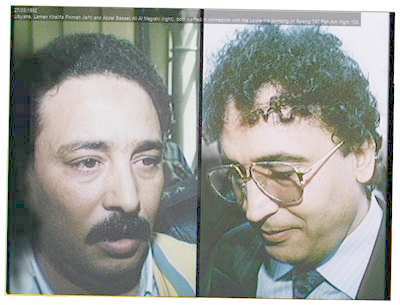 This picture, captioned 'Libyans, Lamen Khalifa Fhimah (left) and Abdel Basset Ali Al Megrahi (right), both wanted in connection with the Lockerbie bombing of Boeing 747 Pan Am flight 103' is from the BBC's picture library. Jeremy Howe, Commissioning Editor, Drama at BBC Radio 4.